For what they are, they're way overpriced. But they are fun to look at. 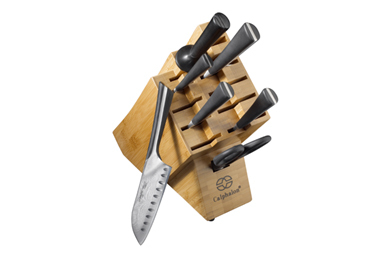 Bill Quick at Daily Pundit just posted on these Calphalon Katana knives. I've been wanting to find some to check them out. I'm very intrigued by the handles as well as the nicely layered blades. The prices seem to run about $20 or so less than Shun blades, my current workaday faves. The handles give me pause, though. There is no indication as to how they are attached to the tang, and they seem to be vulnerable to impact if dropped. That flared end seems ripe for chipping, even though it's poly-resin. I might have to get my hands on one of these. Esthetically, they are wonderful, but I have my doubts as to their practicality. 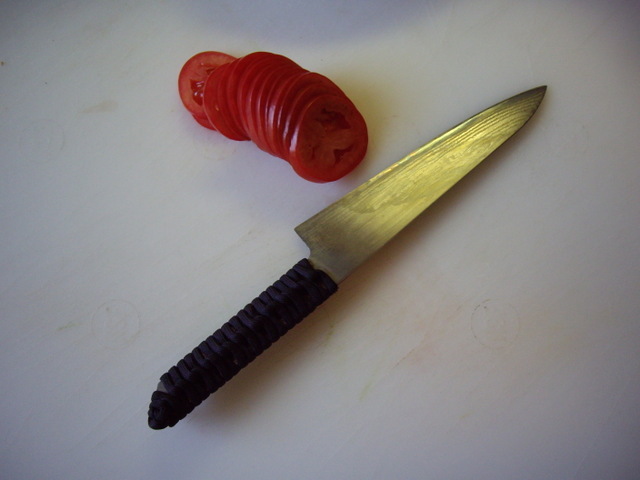 It occurs to me that I never reported on the Shinichi Watanabe knife I gave myself as a Christmas gift. If you recall, it's a 160mm Kintaro-Ame Sanada-Ami Petite blade. It's still sharp as the devil, with just the occasional hone on a very fine waterstone. After five months of constant use, I have to say that I'm extremely pleased with this knife. Small and fast. Great for service work.